SQL and NoSQL do the same thing: store data. However, they are differentiated by a number of key features; how they are built, the type of information they store, and how they store it. While relational databases are structured, like phone books that store phone numbers and addresses, non-relational databases can be document-oriented and distributed. Comparing these two types is like saying boats were superseded by cars because they’re a newer technology. They take different approaches, which may help or hinder your project. In a brief comparison analysis we identified a number of features that may help in deciding which is best for your needs. Because each data base type focuses on managing the data differently, a direct comparison on performance can’t be done. 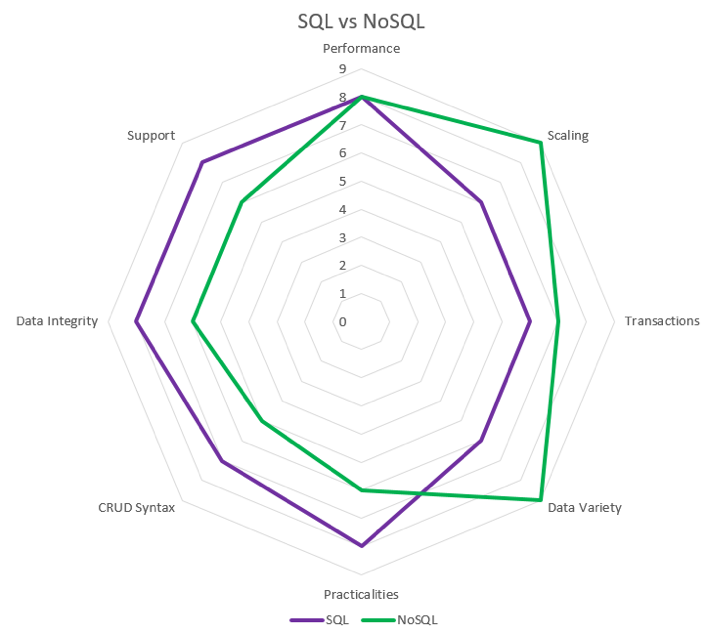 However, a well-designed NoSQL will perform better than a poorly designed SQL and vice versa. Despite that, NoSQL’s simpler deformalized store allows you to retrieve all information about a specific topic in a single request as there is no need for any Joins or complex queries. In terms of data variety, NoSQL support a variety of data, unstructured, semi-structured and unstructured. SQL by comparison, supports structured data with a clearly defined schema. NoSQL scales horizontally whereas SQL scales vertically. From a language perspective, although many systems have slight differences in syntax, SQL is deceptively powerful and has become an international standard. This is part of what makes it so practical to use. Having been around for many years, SQL is understood through many business fields. Consequently, SQL can boast a number of experts, tutorials and research in this space supported by a wide community making its support far more comprehensive than NoSQL. In a nutshell, projects where SQL is ideal include, logical related discrete data requirements which can be identified up-front. Projects where data integrity is essential, and standards-based proven technology with good developer experience and support. By comparison, projects where NoSQL is ideal include, unrelated, indeterminate or evolving data requirements, simpler or looser project objectives where you want to be able to start coding immediately, and speed and scalability is imperative. Despite feeling newer and grabbing recent headlines, NoSQL is not a replacement for SQL, it is an alternative.